Obama Gives Trump and America BIGGEST CHRISTMAS GIFT EVER! Barack Obama is set to give the largest gift in History to incoming President Donald Trump. The gift? $20 TRILLION in debt. In the 30 or so minutes it took to write this article the national debt increased from $19,946,695,394,740 to $19,946,715,394,518 which is an increase of $20,000,000. 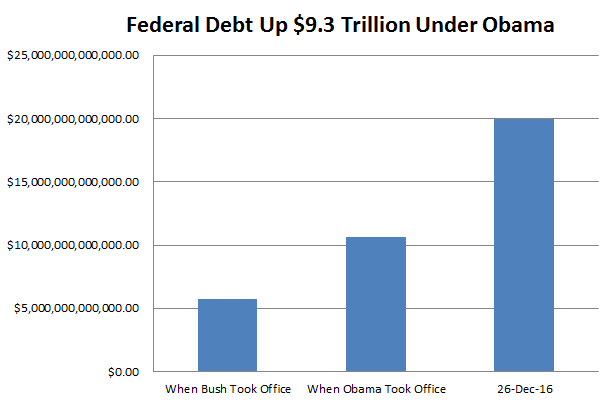 Barack Obama – The national debt grew the most dollar-wise during President Obama’s two terms. When he took over the national debt was at $10.6 trillion. He has added $9.3 trillion and growing to the national debt. When George W. Bush took office the national debt was $5,727,776,738,304.64. When Barack Obama took office the national debt was $10,626,877,048,913.00. In the initial moments of this article being written on 12/26/2016 the national debt was $19,946,695,394,740.